Gulfstream Park’s 20-cent Rainbow 6 could climb as high as $5 million Saturday, or more, due to a mandatory payout. Saturday’s carryover is $998,088 going into today. Gulfstream handicappers Ron Nicoletti, Jason Blewitt and Acacia Courtney look at Saturday’s Rainbow 6 sequence. We have another exciting and life-altering Rainbow 6 mandatory payout on Saturday with over a $4 million pool expected. My strategy is to always try to find a race where I can ‘single’ a horse so I can add more choices in races that are tougher to handicap. It starts in Race 6, and I’m going 3 deep in the opening leg with Sunshine Smile, Crazy for Sophia and Go Astray. Race 7 is another wide-open affair, so I’m going 4 deep with Schettino, It’s a Given, my longshot Valoordo and Golden Point. Race 8 is another competitive field, so I’m going 3 deep again with Dardo, Annie’s Big Boy and Haybub. Only 2 deep in Race 9 with Yo No Se and Great Skellig. In Race 10 I’m using 3 selections with Crazy Frank C, Magnanimous Mine and Capital City. Finally in Race 11 my single is multiple graded stakes-placed Enterprising, who should be the odds-on choice in the finale. Saturday’s Rainbow 6 sequence will cover Races 6 through 11, and I will use a single in the final race to anchor my ticket. My best bet, Enterprising, shipping in from Churchill Downs where he faced Grade 1 company last time out after notching his multiple graded stakes victories at the Fair Grounds in the two races prior, will face eleven other foes in the nightcap, the Soldier’s Dancer Stakes. He is the class of the field and in excellent form for trainer Mike Maker, plus has leading jockey Tyler Gaffalione aboard, who is also very familiar with this horse. 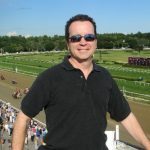 The Rainbow 6 starts with a maiden special weight event for two-year-old fillies, and I’ll use a first time starter in Crazy for Sofia as well as the horse with experience, Go Astray. Having my single in the finale allows me to use some coverage in the middle of the sequence, as Races 7, 8, and 9 in particular are great betting affairs with lots of potential for value. I will spread the most in Race 7 using five horses, and hope for some better priced winners in the races leading up to my single. Two-year-old filly maidens ring in the opening leg of Saturday’s monstrous Rainbow 6 mandatory payout! Only two of the nine fillies entered have raced and a good firster will beat both the experienced Go Astray and Holy Diver. It doesn’t take a genius to see that trainer Antonio Sano has a very “live” runner in Crazy for Sofia, a Mizzen Mast firster who attracted leading jockey Tyler Gaffalione. Sunshine Smiles may get some play as well, given her decent worktab and the presence of an excellent two-year-old sire in Katharos. A big field of 11 awaits players in race 7, a $10,000 claimer on the turf. Little in the ability department separates the majority of this group. Lay It Down had little luck at the draw with his 11 post, but his last couple of races have been good and shortening just a touch to 1 1/16 miles should help him. Vedelago and Golden Point should both run well for excellent barns. In the eighth, Dardo ran a weird but gigantic race first time out. He chased early, suddenly dropped back mid-turn, and then re-rallied late while very green. Considering he caught an extremely wet track and ran so well in his debut, it’s a little surprising Dardo drops in for $10,000. Still, he’s an obvious must-use and will likely find himself a single in more budget-minded plays. Those looking to use another horse may want to look at Mongolian Dancer. If this gelding is going to show anything, it will be in this race as he goes turf to dirt for a trainer (David Kassen) who excels with that move. A dozen turf runners are entered in the ninth on the turf and this leg is a must spread! It’s likely worthwhile to use every bit of Malibu’smostwanted, Yo No Se, Czarmo and Great Skellig. Tough lower-level claimers meet in race 10 at seven furlongs. Let’s Go Ben goes turf to dirt for trainer Keith Bourgeois, who is very dangerous in this spot. Capital City is clearly the gelding to beat, given his current two-race win streak. If he fails to score the hat trick, the aforementioned Let’s Go Ben, Phish Fan and maybe Fenerbahce are dangerous and must-uses. An unforgettable day of racing and Rainbow 6 sequence closes with race 11, the co-featured Soldier’s Dance on the turf. Enterprising is likely to start as a big favorite and single for many players given the top connections in his corner and his classy resume. A B-minus level from Enterprising won’t be good enough to get it done here, but anything above that and close to Enterprising’s best makes him too much racehorse to handle for his foes. Single.